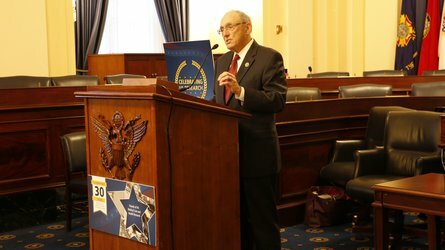 The partnerships between Department of Veterans Affairs (VA) Medical Centers and the nation’s medical schools and teaching hospitals have made them more effective as they work together to tackle timely issues like the opioid epidemic, pain management, mental health, and veteran suicide, according to speakers at a recent Capitol Hill reception. The AAMC joined with the Friends of VA Medical Care and Health Research (FOVA) coalition to celebrate 30 years of FOVA, its continual efforts to advance the VA research program, and its support of patient care and medical research across the nation. The AAMC, a member of the FOVA executive committee, joined with coalition members from veterans service organizations and patient, provider, scientific, and academic communities to highlight FOVA’s contribution to advocating on behalf of VA medical research. Speakers included House Veterans’ Affairs Committee Chair Phil Roe, MD (R-Tenn.); House Military Construction, Veterans Affairs, and Related Agencies Committee (MilCon-VA) Ranking Member Debbie Wasserman Schultz (D-Fla.); Carolyn Clancy, MD, deputy undersecretary for discovery, education, and affiliate networks at the Veterans Health Administration; and Rachel Ramoni, DMD, ScD, chief research and development officer at the VA.
Ramoni noted that the fiscal year (FY) 2019 MilCon-VA spending package, which was signed by the president on September 21 and included a 7.9% increase for the VA research program compared to FY 2018, has the potential to lead to lifesaving cures and expand the VA’s ability to conduct more clinical trials. 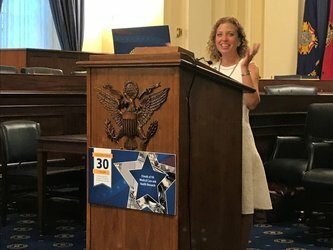 “I am sure I would not be here today if not for medical research; that’s why I remain committed to ensuring this issue remains a priority,” said Congresswoman Wasserman Schultz, a breast cancer survivor. She also highlighted research advances benefitting veterans nationwide, like improvements in prosthetics, including those specially designed for female veterans.